I was recently contacted to do an interview about an Instagram post I shared. In the post I'd explained how for the last 3 years I had slept outside for at least 31 nights of each year. For the last 3 years I've slept outside for at least 31 nights of each year. 1/12 of the year out in nature. To some this will seem extreme and to others this will seem a small amount. But out of everything I've been doing recently sleeping outside is still the single best way I've found to increase my connection to nature, remove distractions, and gain clarity. If you're looking for the same and don't sleep outside that often set yourself a target this year and go for it. You won't regret it. Kudos to @semi_rad for giving me the idea of counting. I can't take the glory of this idea unfortunately, I became aware of it after this blog post caught my attention. The idea really resonated with me, could I spend at least 1/12th of each year sleeping outside? The challenge, initially, started as a one off. But, it's grown into something more. It's become a bit of a philosophy for me. A way of keeping track of whether I'm prioritising one of the things I see as important in life. Connecting with nature and spending time outside. If you have a full time job, it can be hard to make time for nature these days. Most people don't work in nature, don't live in it, don't collect their food from it, don't exercise in it. We can go a long time without truly being in a natural environment. Which... doesn't seem very natural. What if we can escape every once in a while and sleep outside, away from wifi, away from responsibilities, away from all the things that need to get done, and just live life a little more naturally? It's not about doing the biggest, first, scariest, hardest, it's about sleeping outside. It's about establishing a little more connection to the natural world than we do in our modern, everyday lives. Sure, it would be easy to reach 31 days if we quite our jobs and travelled. But, that's not what this is about. It's about maintaining a connection while maintaining a "normal" life. Reminding ourselves that we are always part of nature. That spending time in the wild places feels natural because it is. How many nights can YOU sleep outside this year? I can't get use to the stars. Those moments when you look up and see the stars, not the city stars when you maybe see three, I mean properly see them, still catch me by surprise. I've spent a reasonable amount of time camping and sleeping outside, measured against some it might seem an excessive amount, against others I'd be a rookie. Either way, every time I find myself outside on a clear, dark night and look up I am shocked to realise that this is the view we have blocked from ourselves. Our modern lives of electricity and lighting have meant that for the majority of us that unbelievable panorama is a rare sight. Some people will have lived their entire lives having never even experienced it. Yet without our intervention this view would always be there. The latest star gazing wasn't far away from the city geographically but it was a long way away in nearly every other comparison. It was a public holiday over in Vancouver this weekend and that means one thing, get out of the city. This time around Rachel and I decided to continue exploring the nearby islands by bicycle with a trip to Lasqueti Island. Lasqueti, from afar, looks like any other island in the Salish Sea that sits between Vancouver Island and the mainland. The main and quite significant difference with Lasqueti is that it is a fully off the grid island. No electricity, no mains water, no gas. I have always dreamed of living off the grid, it is something I plan to try to some extent in the future but living in the city doesn't make it possible for the time being. I love the idea of living in sync with nature, being forced to live a simpler life and leaving as little footprint as possible. So it was with some excitement that we set off to see what is created when approximately 380 people choose to live off the grid on an island. There is no camping on the island so we stayed in a tiny cabin which was little more than a shed. No facilities, just a bed and a composting toilet, we had to bring our own water and food, and take any trash we made home with us. It might sound like hell to some but for us it was all we needed. We cooked food on our camping stove, listened to the wildlife around us and were, of course, surprised by how bright the stars were. When I first spoke to people about Lasqueti it seemed to have some mixed reviews from both previous visitors and those who have never even stepped foot on the island. As with anything that goes against the grain it attracts criticism from those comfortable getting in line. I find it strange that as a society we are so fearful of people doing things differently. The stereotypical tag of "hippies" is so often thrown around whenever the words off the grid, nature or even organic is used. It makes no sense to me that the people selflessly trying to look after the planet are the odd ones. I wasn't there long, but long enough to see enough. What I did see was lots of smiles amongst the odd disapproving look, a tight community mixed with some fierce independence, the health conscious, hemp wearers and the beer drinking, chain smokers, some unbelievable levels of self sufficiency as well as a reliance on diesel powered generators and food brought in from outside. The people were really no different to anywhere else except for one thing. Everyone there had made a conscious decision to live on this off the grid island. Everywhere I looked I saw someone who was taking a big step to being the change they wanted to see in the world and it was inspiring. We left the island and headed inland on our bikes to spend some time camping and to digest a bit of what we had just experienced. 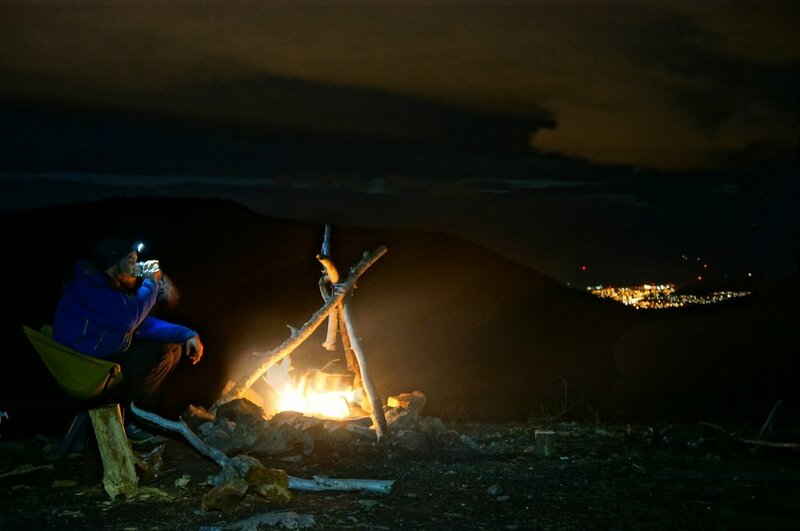 Sat round the campfire, with our few belongings we managed to bring on our bikes, making a meal out of the very last of our food, listening to the wildlife, I was again surprised by the stars. I may not be able to live off the grid in the city but I realised if I am in pursuit of living in sync with nature, being forced to live a simpler life and leaving as little footprint as possible then sleeping outside in this way will do for the time being.